Is There Hope For Your Church? Dr. Gary L. McIntosh believes there is hope for your church. Join him in an exploration of how to turnaround a plateaued or declining church. 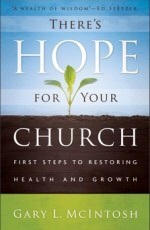 Purchase his practical book There's Hope For Your Church: First Steps for Health and Growth.